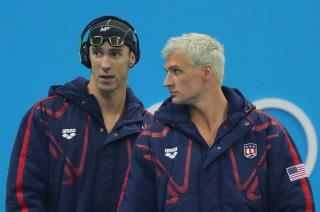 (Newser) – American swimmer Ryan Lochte had a brief brush with becoming the late American swimmer Ryan Lochte early Sunday, he tells NBC News, when he and three other swimmers were held up at gunpoint while returning from a party in Rio. Men posing as cops pulled over their taxi, he says. "They pulled out their guns, they told the other swimmers to get down on the ground—they got down on the ground. I refused, I was like we didn't do anything wrong, so—I'm not getting down on the ground." My, my now don't you all have egg on your face so to speak? Ryan Lochte lied about the whole thing to gain some publicity for himself at the expense of Rio and their financial losses in the tourist industry. The little so and so should be required to return to Brazil and face financial restitution and jail time. The worlds people have a tainted point of view of what most of us Americans are like due to people like Kim Kardashian, Lindsay Lohan and this privileged little worm. The IOC should remove him from participating in any more events for life and take any awards/metals he has received (if any) due to his lack of honesty and lack of any ethics or integrity which all Olympic athletes should and I believe do adhere to as a principal to a code of honor/ethics. He, in part because he represents the USA and the Olympics, is a role model to many children in this country and his actions and behavior regarding this entire situation (falsifying a crime, running from being prosecuted by Brazilian authorities, letting his fellow teammates be detained and possibly face fines and jail time for his actions, blatantly lying to everyone he could rant about his fake robbery including an interview on the Today Show, days after he began this stunt, to further his own publicity and further disgrace his team, his teammates and the US Olympic athletes by continuing this only to further his own need to be in the media spotlight. He tried reality TV on a major cable network but his true self showed what a truly egotistical jerk he is and how he laughed at a date he had gone on because he is so hot and wanted that he had another date right after the first one and during both he talked about only himself and his dates paid for most of their time together because his contribution is letting them spend time with him. Can someone please start a petition to no longer hold the Olympics in third-world shitholes? after this Brazil will no longer have a tourism industry from any decent people.